The great folks over at Sparkling ICE are sharing one of their fabulous dessert recipes with all of my readers today. If you are not familiar with Sparkling ICE, here is some information about it. Sparkling ICE is a naturally-flavored sparkling water that contains zero calories, zero carbs, is gluten-free, and lightly carbonated. An excellent soda alternative, Sparkling ICE contains B-Vitamins, Vitamin D and antioxidants, along with a caffeine-free Green Tea Extract that is known to have powerful levels of antioxidants. Available in 8 delicious flavors including Coconut Pineapple, Lemon Lime, Kiwi Strawberry, Lemonade, Orange Mango, Pomegranate Berry, Pink Grapefruit, and Black Raspberry, this beverage is perfect for year round sipping and snacking! In a small saucepan, heat 1 1/2 cups of Sparkling ICE and lime juice to a boil. In the meantime, place apple juice in a medium heat-proof bowl and sprinkle gelatin on top. When gelatin is soft, pour hot juice over and stir to thoroughly combine. Stir in remaining Sparkling ICE. 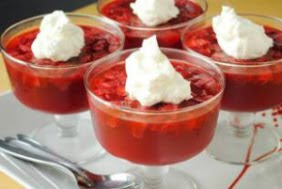 Distribute raspberries among 4 small dishes or ramekins (or put all in a larger container for family-style serving) then evenly distribute gelatin mixture. Place in refrigerator and allow to cool until set, approx 4-6 hours or overnight. Top with whipped cream, if desired.